Evidence shows that people in the Middle East, already as far back as 14,000 years ago, were starting to tame dogs. However, researchers are not sure whether this was by accident or design. New research from the University of Copenhagen and University College London reveals that the use of dogs in hunting provides the best explanation for the major increase in the number of bones of small animals that they have excavated from Stone Age settlements in the Jordanian desert. 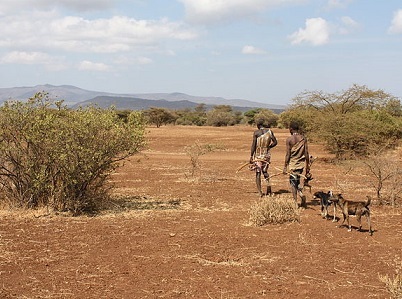 The animal bones discovered in the 11,500-year-old settlement of ‘Shubayqa 6’ reveal that not only were there a lot of dogs living in the area, but also that men and animals probably hunted together. “Our study shows that a very large proportion of the bones show unmistakable signs of having passed through another animal’s digestive system,” said University of Copenhagen archaeologist Lisa Yeomans. “These bones are so large that it is impossible that humans could have eaten them, so it must have been dogs,” she added. The archaeologists think that the dogs have not lived on the periphery of the settlement but have been an integral part of daily life and have been allowed to move around freely. “We can see that they’ve gnawed bones and excreted over the whole area,” said Yeomans. The archaeologists also noticed a sudden increase in the number of bones from hares at the same time that dogs made their entrance at Shubayqa 6, and they feel that there is a connection. “We can see more hares have been caught, but also that the ones caught after the dogs came along are different. That could be connected with the introduction of new hunting techniques,” added Yeoman. Previously, hares were hunted with nets, so both old and young ones were trapped, but with dogs it was possible to hunt exactly the type of hare one wanted to catch.